Mercedes drivers Nico Rosberg and Lewis Hamilton were all fired up as they posted the fastest times respectively in Free Practice 2. Fernando Alonso's Ferrari was fired up too, literally, as the engine caught fire while he was out on track during the final third of the session. The ambient temperature at the start of the 90-minute session was 84 degrees Fahrenheit (29 degrees Centigrade) and the track temperature was 129 degrees Fahrenheit (54 degrees Centigrade.) The humidity was 51 percent. The 18 car line-up was as follows: Red Bull Renault‘ Sebastian Vettel and Daniel Ricciardo; Mercedes ‘ Lewis Hamilton and Nico Rosberg; Ferrari ‘ Fernando Alonso and Kimi Raikkonen; Lotus Renault ‘ Romain Grosjean and Pastor Maldonado; McLaren Mercedes‘ Jenson Button and Kevin Magnussen; Force India Mercedes ‘ Nico Hulkenberg and Sergio Perez; Sauber Ferrari ‘ Adrian Sutil and Esteban Gutierrez; Toro Rosso Renault ‘ Jean-Eric Vergne and Daniil Kvyat; Williams Mercedes ‘ Felipe Massa and Valtteri Bottas. Perez would not run in FP2 as Daniel Juncadella had crashed his car in FP1. Gutierrez was the first driver out on the track. Grosjean was next, followed by nobody as the others were not in a big hurry it seemed. Maldonado eventually joined them. 3 minutes into the session, Gutierrez posted the first time ‘ 1:18.173, and then Grosjean eclipsed that with a 1:16.001. Maldonado got into the act with a 1:15.467. 9 minutes into the session, Magnussen topped the times with a 1:15.232. The team had repaired Button's machine and he was out there getting in some laps after doing just one in FP1. 11 minutes into the session, Vergne stopped on the track at Turn 4 and climbed out of his car. Bottas, meanwhile, was up to second place and just 0.033 of a second slower than Magnussen. 14 minutes into the session: Red Flag to retrieve Vergne's Toro Rosso. 18 minutes into the session: Green Light. 21 minutes into the session, Raikkonen took over first with a 1: 14.981 only to have Rosberg beat that with a 1:14.681. 22 minutes into the session, Ricciardo posted a 1:14.499. Raikkonen responded with a 1:14.207. 24 minutes into the session, Rosberg rocked with a 1:13.572. 26 minutes into the session, Ricciardo did a 1:13.546 as Massa moved into fourth. At the one third mark, the top six were: Hamilton, Ricciardo, Rosberg, Massa, Raikkonen and Alonso. Moments later Hamilton improved to a 1:13.072. At this stage the drivers were still on Pirelli's medium compound with the white sidewalls. "The track is really difficult to drive right now," Hamilton radioed, "in those temperatures." 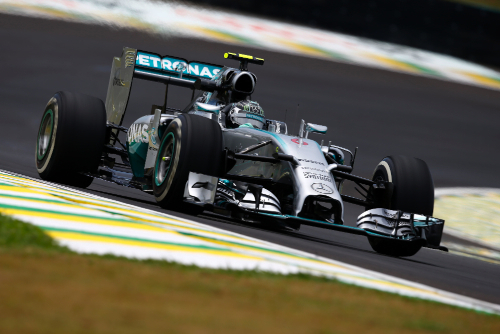 Rosberg had now moved up to second with a 1:13.275. 42 minutes into the session, Ricciardo put his Red Bull out front with a 1:12.956 using the soft compound with the yellow sidewalls. Vettel's run on softs netted him fourth place with a 1:13.820. Midway through FP2 the top six were: Ricciardo, Hamilton, Rosberg, Alonso, Massa and Raikkonen. Vettel radioed in that there was something seriously wrong with his car. With 39 minutes remaining in the session, Bottas netted fourth with a 1:13.035 on softs. The top six were now: Rosberg, Hamilton, who had done a 1:12.336, Ricciardo, Bottas, Massa and Kvyat. With 35 minutes remaining in the session, Raikkonen grabbed third with a 1:12.696. With 31 minutes remaining in the session, Raikkonen had an "off" at Turn 12. At the one hour mark the top six were: Rosberg, Hamilton, Raikkonen, Ricciardo, Bottas and Massa. Alonso, Kvyat, Vettel and Magnussen rounded out the top 10. Now everybody settled in for long runs to check tire degradation. With 24 minutes remaining in the session, drama as Alonso stopped his Ferrari between Turns 3 and 4 with flames shooting from the engine. He hopped over the guardrails to grab a fire extinguisher. The session was red flagged. The top 10 at this time were: Rosberg, Hamilton, Raikkonen, Ricciardo, Bottas, Massa, Alonso, Kvyat, Vettel and Magnussen. Maldonado, Grosjean, Hulkenberg, Gutierrez, Sutil, Button and Vergne rounded the top 17. With 16 minutes remaining in the session, the green lights came on. In their haste to get out, Raikkonen and Massa almost collided in pit lane. A laughing Alonso walked down pit lane. Could it be he thought his car got what it deserved? With 13 minutes remaining in the session, Gutierrez parked his Sauber virtually at the same spot as Alonso. Red Flags and d ©j vu minus the fire. With 9 minutes remaining in the session: Green Lights. Now the drivers just used up the final time getting in as many laps as possible. The top 10 at the end of FP2 were: Rosberg, Hamilton, Raikkonen, Ricciardo, Bottas, Massa, Alonso, Kvyat, Vettel and Magnussen.